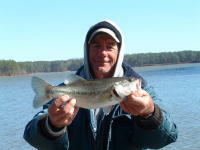 Mention redfishing and a lot of folks will envision technical poling skiffs or a kayak sneaking up on skittish tailers. If that’s not your jam, maybe you like Chatterbaits to marsh pumpkins; or launching topwater baits toward schools of bull reds rumbling across a coastal bay. What’s the common denominator here? Shallow water — the default choice for redfish anglers from Carolina creeks to Northern Gulf marshes. That’s because redfish are often a visual target; they either show themselves directly or with obvious movement (pushes, boils, wakes) or they reveal their position by scaring the heck out of baitfish and shrimp, which dimple the surface and flip skyward as auburn gluttons approach. Fishing pressure, weather extremes and feeding opportunities are the common motivators for redfish moving deep. However, this is not the only option. In fact, a bounty of redfish revelry awaits anglers with the ambition, aptitude and technical savvy to seek a deeper playing field. For clarity, it’s well known that those adult “bulls” spend their lives outside the marshes and estuaries of their youth; so it’s not unusual to find these jumbos patrolling coastal and offshore reefs, Northern Gulf drilling rigs, etc. But the younger “slot” fish also occasionally seek deeper habitats; and that can present a bounty of opportunity. Spawning activity typically occurs in deeper, offshore waters; but for those sub-adult slot fish, heading to greater depths within their inshore/coastal zone often makes a lot of sense. Raymarine pro Capt. C.A. Richardson said fishing pressure and extreme weather events will push redfish to deeper, more insulated waters, but the allure often involves the prime motivators: food and water temperature. Not only does Raymarine RealVision helps anglers locate fish off both sides of the boat and below, it reveals exactly how deep in the water column. Indeed, from rock jetties to bridge pilings, to the debris piles dumped near a bridge, deep habitat with greater warmth and feeding opportunities often goes overlooked by anglers fettered with a one-dimensional mindset. Another example: oyster reefs that never see direct sunlight. Outgoing tides expose a lot of shallow shell mounds, but those below the mean low tide line remain covered. “In colder months, redfish aren’t going to be on the flats at 8 o’clock in the morning; often times, they’ll be on those inlets and those passes and bridges when it’s really cold in the dead of winter,” said Richardson, who runs a Raymarine eS12 Hybrid Touch and a 12-inch Axiom Pro unit on his bay boat and a 7-inch Axiom on his poling skiff. “As soon as we get to midday, they’ll often move up to a nearby flat to warm up and feed. As Richardson notes, the evolution of CHIRP sonar simplifies the search by providing ultra-clear returns with verifiable target separation. Other words, wishful wondering is a thing of the past. Anglers can easily customize Axiom/Axiom Pro split-screen views to suit exactly where, how, and what they’re fishing. “There’s no guessing; a lot of times the Raymarine CHIRP sonar technologies will show the outline of a fish,” Richardson said. “You can see ‘That’s a tarpon. That’s a bigger, fatter fish; that’s probably a grouper. That’s a longer fish, that’s likely a snook or a redfish. You can literally see a signature on the screen and have a pretty good idea what you’re looking at. Wherever redfish run deep, you’ll be wise to keep a diverse selection of baits handy so you can dial in their preference. Lead head jigs with shad or curl tails are always a good bet, as are the flutter spoons and slender blade jigs, which dance in the water column like wounded baitfish. Deep diving crankbaits, Carolina-rigged plastics and a beefed-up dropshot will also tempt these fish. Richardson describes one of his favorite scenarios for redfish, as well as a mixed bag of cast-worthy species. When cold, blustery weather turns the shallows uncomfortable, he looks to the deep residential canals, especially the ones where yachts or big sailboats mean at least 8-15 feet of depth in front of their docks. “I’ll idle my skiff through those areas with my Raymarine SideVision and DownVision on and look for the bait schools or the fish that are piled in there,” Richardson said. “Especially the first day after a cold front, you’ll see them stacked up and that’s when I start fishing with very small Z-Man Ned Rig jig with a Z-Man Slim SwimZ or Finesse ShadZ or fast-sinking MirrOlures (32M, 4M or 52M). Richardson suggests a slow, measured pace controlled with light rod tip motion. Employing this technique, catches redfish, snook, trout and the occasional doormat flounder. In the Northern Gulf, drilling rigs commonly attract the larger bull reds. Here, again, Raymarine’s ultra-clear CHIRP sonar plays an invaluable role in the angler’s time management. Rather than hitting every dock in a canal and hoping he’ll run into a few fish, Richardson looks before he casts. “You don’t have to guess which canals have fish; you just turn on your Raymarine and slowly idle until you find a canal that’s stacked up with fish,” he said. “Then, you think about why the fish are there. Maybe it’s a east-west canal that doesn’t have the cold north wind blowing into it. Maybe the fish are in a corner that faces south and it’s on a northern seawall that absorbs the sun’s heat all day long. Granted, it can be much easier to find redfish in shallow areas — sight fished, or not; but the deep stuff merits a spot in your game plan. For one thing, the fish are almost always biting and you’ll rarely have to worry about company. So, shhhhh — don’t tell anyone. Captain C.A. Richardson is among the featured speakers at the Reel Animals Boat Show and Fishing Expo today through Sunday at the Florida State Fairgrounds east of Tampa. Visit www.reelanimalsboatshow.com for schedule and other details. This entry was posted in How To Fish, Saltwater Fishing on November 20, 2017 by ronniegarrison.